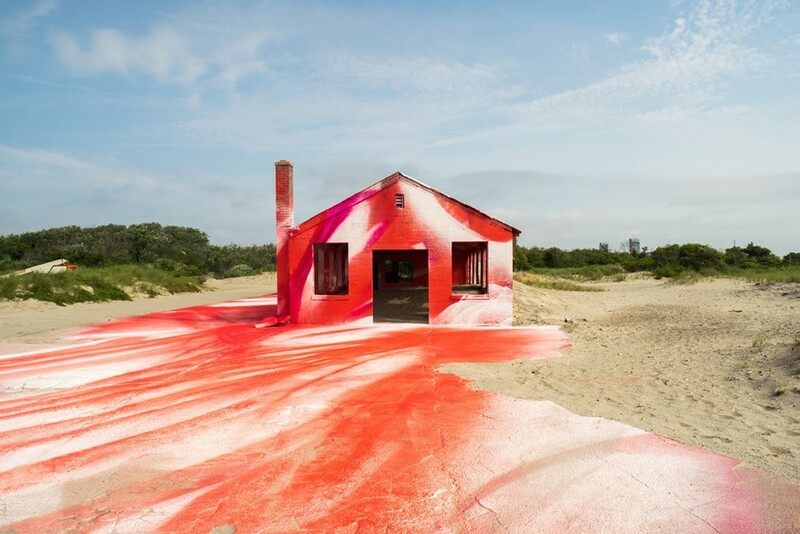 Katharina Grosse's immersive, kaleidoscopic vision has long enthralled international audiences. The 55-year-old German artist is a painter first and foremost, but since the 1980s her work has traversed the edge of the canvas to reach new extremes, covering rubble, felled trees, and gigantic sheets of fabric. Grosse routinely transcends two-dimensionality to broach the altogether more ambitious category of landscape art, reinvigorating contemporary audiences in the process. Take the appearance of her 2015 piece, Untitled Trumpet, at the Venice Biennale, for example; in the midst of a politically charged exhibition, Grosse's installation – a room-wide scene that transformed heaps of rubble into a vibrant, rainbow-striped dystopia – was a breath of fresh air. Her newest piece, Rockaway!, is similarly refreshing, and not least because it confronts the trauma which follows natural disaster head on. 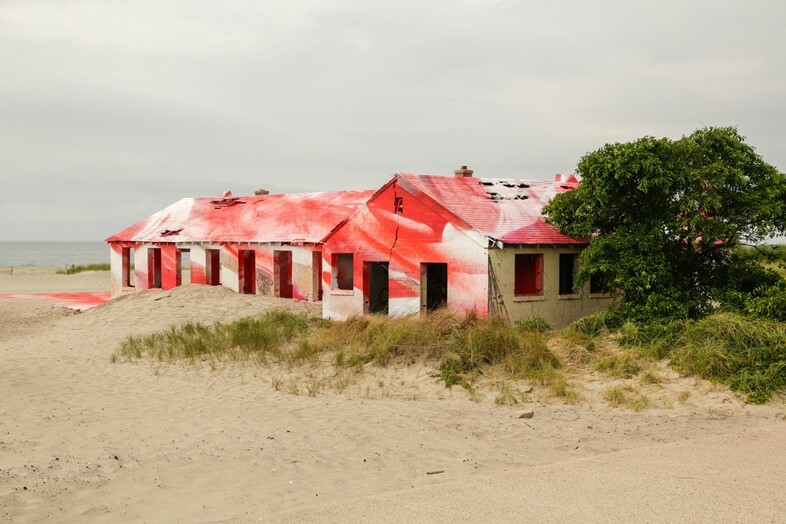 Grosse received the commission from New York's Museum of Modern Art to transform a derelict army base at Fort Tilden – a building all but destroyed by Hurricane Sandy, which hit the area in 2012 – into a symbol of renewal. 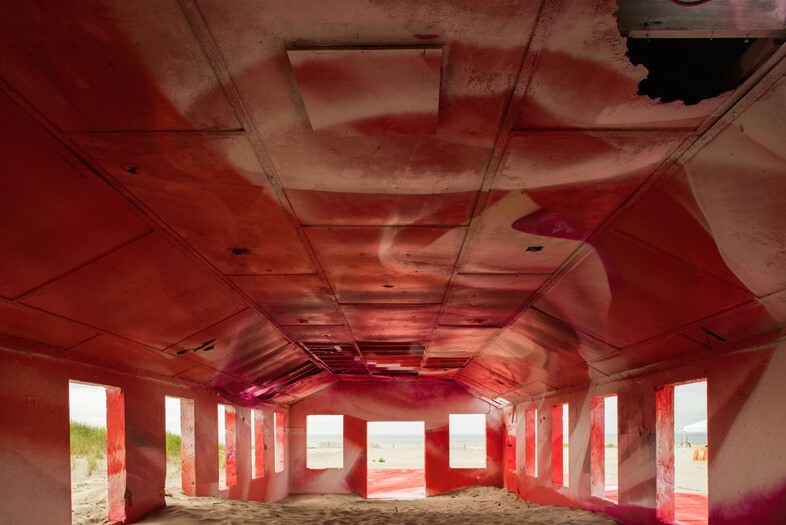 The artwork is part of an annual exhibition series documenting the legacy of the hurricane along the vulnerable coastline of Rockaway Beach, taking the tragedy of natural disaster and transforming it into potent creative expression. And the resulting piece certainly is powerful. A visceral swirl of red, white and pink covers every last inch of the structure in a wave of colour, a beacon of fierce defiance and hope in an otherwise bare landscape. What's more, the building is due for demolition at the end of the year – the artwork's ephemeral nature lending it even more poignancy. Struck by both the impermanence and resonance of the Rockaway! project, AnOther sat down with Grosse to discuss the logistics of working on this scale, her influences, and how she dissects the fundamental principles of painting to push the medium forward. "I was in Europe when [Hurricane] Sandy happened, and I felt involved as I've spent a lot of time in New York, and I have many friends here. The project came to me through Klaus Biesenbach [director of MoMA PS1], who saw my painting in New Orleans after Hurricane Katrina. He was the one who noticed the potential for this special spot at Fort Tilden to be connected with my work, and that I could do something with it, change it, transform it. These large-scale and site-specific works really require a curator who is aware of the context and the history of where we're showing. Klaus and I had long, very interesting conversations before I started working on this piece." "I think ambition is very important to my process – to be able to visualise the scale of the painting will eventually take, not thinking about it as a series of brush marks, but something that really takes advantage of paint as a powerful, unleashed energy force. I've worked on large-scale pieces before, but the difference here is that you can see it from a distance. It's a complete reversal of experiencing my work in the gallery setting, where it often takes up the whole room. Here you can look at the work as if through binoculars, whereas in the gallery it's like looking through binoculars turned around the wrong way." "My relationship with America has less to do with any painting tradition – comparisons to Jackson Pollock I find very narrow. I like art that forces me to think in new ways. I'm fascinated by cave painting, Renaissance frescoes, theatrical staging, and in opera, the way the stage-sets express emotion. There’s probably a connection to the 1960s here – Robert Smithson's Buried Woodshed for example – despite the fact I use the surface as something imaginative, rather than material like Smithson or Michael Heizer. Their approach was more factual and was dismissive of the gallery and the institution, which is not at all how I work. I prefer not to be limited, to use all sorts of different platforms and contexts for my work." "I really see the painted image as something generated by the body, and that resonates with the body. You need that materiality and that trace of the body for it to work. Another thing I think painting possesses that you don’t find elsewhere, is the first applied layer and the last being present at the same time. It's a very simple, synoptic time-field with no beginning or end, no sense of 'oh it starts here, and then it runs for 30 minutes,' like with language or music or film. It's a fusion of all of those different layers of time, which is a fascinating ingredient to play with. Painting can be difficult. It's like playing a game – you remember the moves, they're still present in your memory. At times, it can feel like I’m playing chess against myself." Rockaway! is on view at Gateway National Recreation Area at Fort Tilden, New York City, until November 30, 2016.